Nightsteed snorted. "They need you to care. Cities need that. They're like wagons; they can move on their own but they need to be lead or they'll end up off the road..."
"That's it!" snapped the last Dark Faerie. Her yellow eyes flashed dangerously, and the other two Faeries turned to face her. "We have control of the situation..."
There was no sound that fell into Avari's ears – nothing but a deep and impenetrable dark cold that seemed to press on her like a thick, icy blanket. She could see nothing. Nothing. Nothing! "You don't have a plan?" Zoland asked incredulously. "You're supposed to be the one leading us!" "So!" Skarl leaned forward on his elevated platform, pointing down to the potatoes. "Thanks to a very kind donation from the Potato Counter man, we have..."
He could smell food, breakfast. It almost smelt like porridge. His eyes wandered over to Biscuit's sleeping mat, but he was still there, peacefully dreaming. Then who? "See here. Every morning I wake up and look out, and I see the Money Tree, all big and beautiful. It's a Neopian symbol! Why would you cut it down?" Hand-picked and chosen, researched thoroughly, here they are! 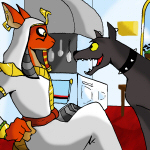 My Top Ten Spooky Petpets! A misunderstanding about the principles of customisation. It's A Neopets Addiction, Doc! Oh, I'm sorry, I meant 3 times LESS!